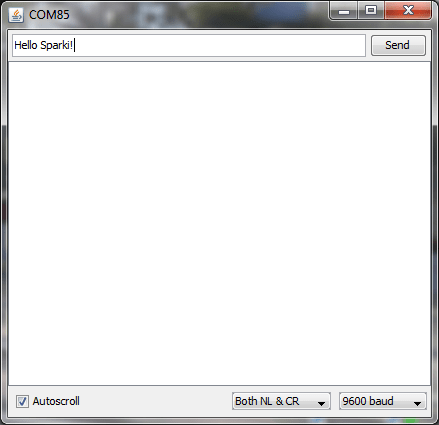 Sparki features several communications capabilities. Among them are two easy to use serial ports. One of them is a serial connection that works through the USB cable that you can use to program the Sparki. The other serial port is a Bluetooth wireless module (also available for advanced uses in the Expansion Port). A quick note about failing to upload code- Sometimes Sparki gets hung up and you can’t upload code to it because there is serial communication happening. If this happens try turning Sparki off, unplugging your USB from both Sparki and the computer, waiting for at least thirty seconds and then plugging everything back in before trying to upload code again. If Sparki still won’t accept code try doing everything I just outlined AND closing the SparkiDuino application. If you’re having trouble try this. The Bluetooth module included with Sparki. Please note the delay command after sending the text. This is because Sparki’s microcontroller is much faster than the serial port, so if you omit that delay, the serial port will be saturated since we are sending the text each time the loop function iterates, not showing the expected results. Of course, a delay of 1 second (1000 milliseconds) is high and the communications can work faster than that. But this long delay here lets us see the results on the terminal’s screen comfortably: Note: If you are already an Arduino user, you may be wondering where the Serial.begin command is. Well, it’s not really necessary when using Sparki’s USB serial port, since the robot’s software libraries initializes the port automatically when loaded. Strictly speaking, the constructor for the SparkiClass calls the Serial.begin function (but please don’t worry if you don’t understand this, since everything is automatically managed by the software and it’s not really necessary for this lesson). So, what about the speed of the connection, or baud rate? If you make a small experiment and change the baud rate from the terminal, even when the program is running, you will note that the communications continue working. Please try selecting there another value, like 115200 for example: Why? Well, this is beyond the materials in this lesson, but the basic idea is that Sparki’s port isn’t a standard physical serial port. Instead, it’s an emulated serial port over a USB connection (also called USB-CDC), which in certain ways adapts to the communication speed selected in the terminal. So, it should work with any baud rate selected on your terminal except with 1200 baud (for a complex technical reason that we are not going to explain here). Note: If by chance you select the 1200 baud speed in the terminal, Sparki’s serial port could disappear from the serial ports list in your SparkiDuino software. In that case, you should make a Manual Upload of any example program to see the port again in the list. 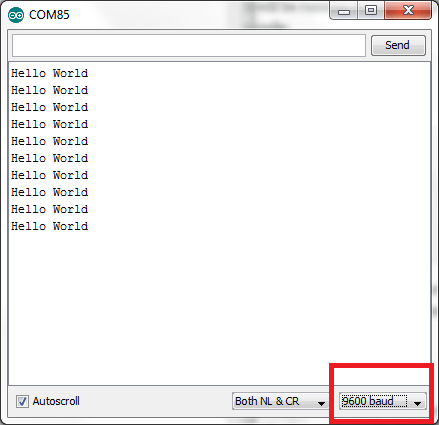 Serial.read will get the last received character from the serial port and store it in a variable. In this code the variable is called “inByte.” We call it that because it is “incoming” information and it’s size is exactly one byte. If you’re interested in learning more about why it’s important to know about the size of your variable, click here. 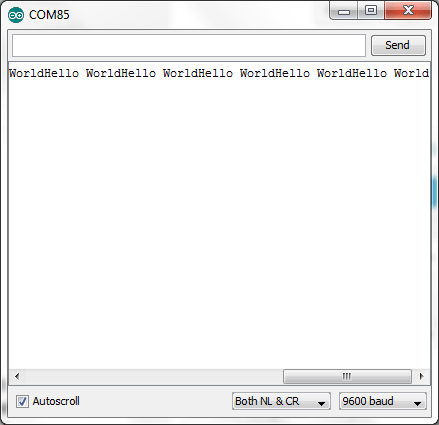 After that, the stored character will be sent again back to the computer using the Serial.print command. The (char) portion of the code makes sure that Sparki is converting the communication variable information into a character type variable so that we can read it as text. If you want to scroll back through your communications with Sparki simply click on the Autoscroll button so that option is not selected. 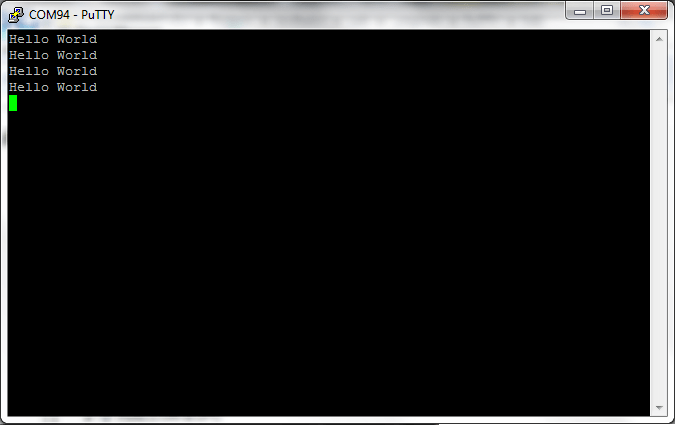 With this code above the terminal window will fill up really quickly and you might miss some of your communication. If you like you can change the delay command so that Sparki waits a longer time before sending the “I’m bored” message, but the downside of this is that it will take longer for Sparki to check the information in its serial buffer. Sparki’s serial buffer is where it stores incoming information before it reads the information, kind of like your mail box. The more days you wait before checking your mail, the more there will be, right? 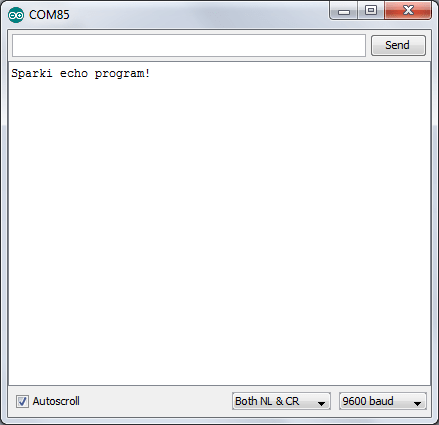 With a longer delay command you’ll probably be able to send multiple messages before Sparki can read them, so they’ll pile up in Sparki’s serial buffer and only be sent back to the Terminal on your computer once Sparki exits the “else” statement and sees that there is information available in the serial buffer with the “if” statement. 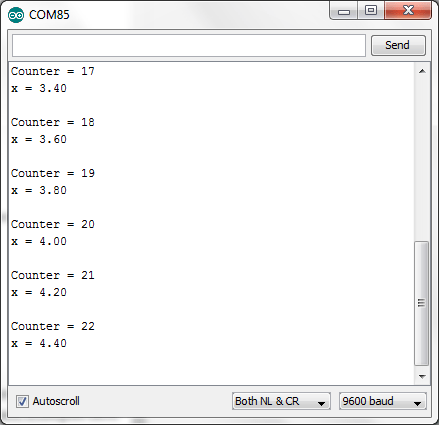 int counter = 0; // integer variable. float x = 0.0; // floating point variable. 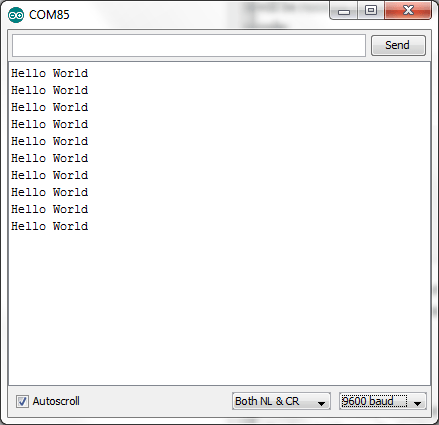 The first test that we should do to ensure that our Bluetooth module is working fine is to run the Hello World program, but where we used Serial we want to change that to Serial1. We’ll also need to add the Serial1.begin(9600) command to the setup function. 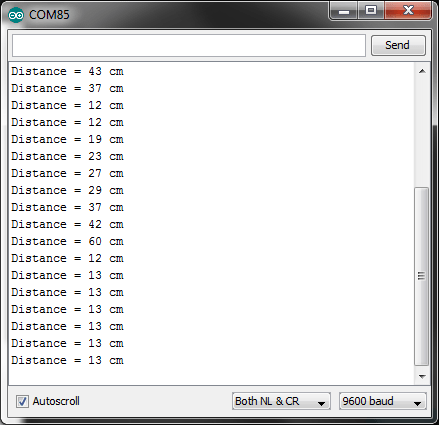 This command tells Sparki that the communication we’ll be sending over the Bluetooth Module will be at a speed of 9,600 bits per second or a baud rate of 9600. It’s important to be aware of this number because it needs to match in the code running on Sparki and in the program on your computer or device you use to receive the communication from Sparki. If Sparki is “speaking” at a faster or slower speed than your receiving device can “listen” (if the baud rates don’t match up) then the communication will be show up as gibberish. 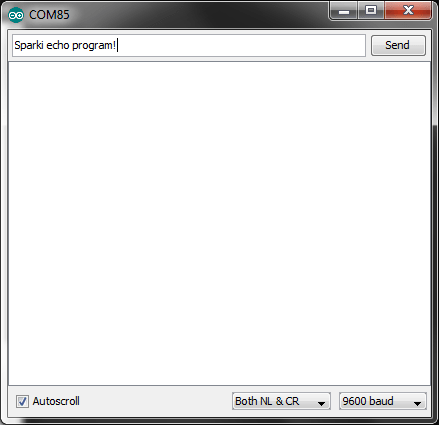 On computers running Windows, using the Bluetooth communications will require a bit of extra effort, since the Arduino terminal (which is the terminal used in SparkiDuino’s software) may not be able to work with Bluetooth serial ports. 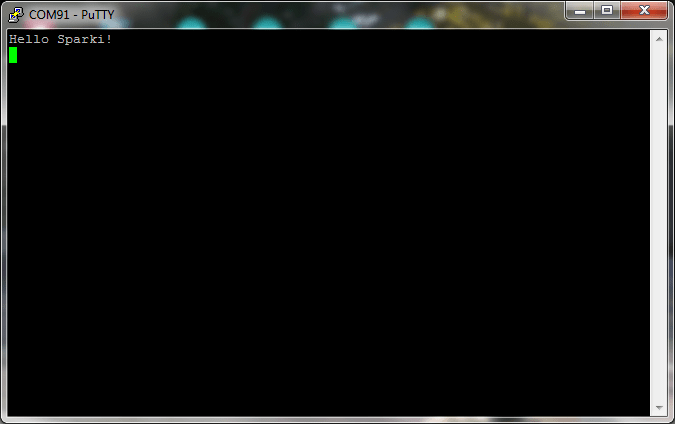 So, to ensure that everything works properly, we will install a better terminal program. There are a lot of free terminal programs out there, but one of the best is PuTTY. This flexible and reliable software will allow us to work easily with any serial connection, being it over Bluetooth, USB, etc… Once you have downloaded PuTTY, you just need to run it. In the first screen, please select Serial and configure the port of your Bluetooth connection, as well as the Speed, which should be 9600: Them press the Open button. 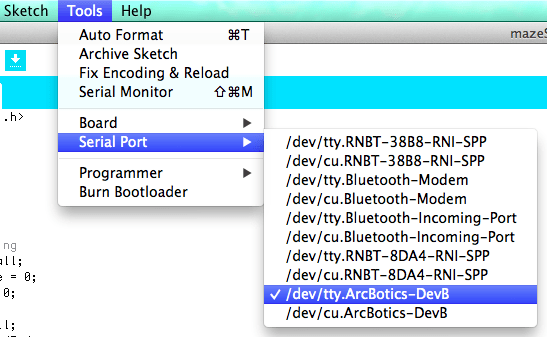 Your Bluetooth module in the Sparki robot should stop blink (the LED there will be ON permanently while a connection is established), and the following screen will appear: With a Mac you can just go to Tools in SparkiDuino, select the Serial Port menu and make sure that your Bluetooth Module serial port is selected, and then click on the Serial Monitor button to see the “Hello World” message. Great! We’re reading in commands. That’s the first step. Now we need to put the value stored in the inByte variable into a String. First we need to convert the integer value of the inByte to a character and then we need to add that character to an empty String. (And we need to initialize an empty String.) 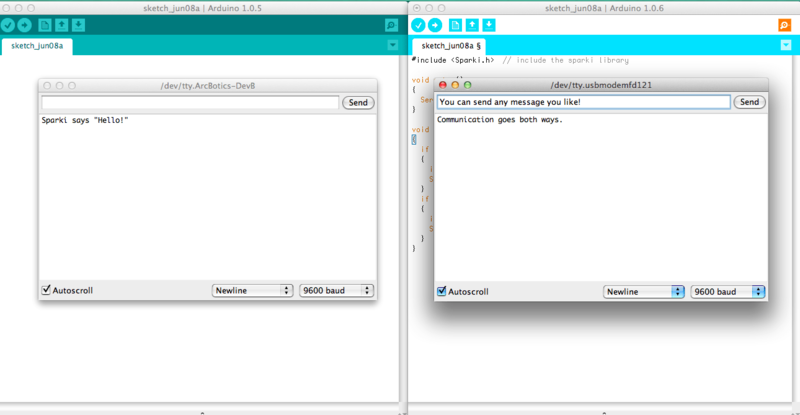 Adding the character to a String is called concatenation and it’s actually really easy with SparkiDuino! Serial1.println(inputString); //this code is for debugging and checking comm. Now we can check out how this code works by opening the Bluetooth serial monitor and typing in some text. Try typing the word “Right” and pressing the Return key or the Send button. Does it show up scrolling back to you in the Serial monitor? Ok, next try typing the word “Left” and pressing the Return key or Send button. Something a little strange happens now, doesn’t it? So when there was just one word, “Right” everything was pretty normal, correct? But then we added a second word to the communication and it turned up on a second line. That’s because the carriage return (our pressing of the Return button) also gets stored in the inputString! So if you keep adding more and more communications to this you’ll get a longer and longer set of words being stored inside inputString. That’s no good for what we want our code to do, is it? No, it’s not. So we need to add a little bit of code that resets inputString to an empty String if there is a new line of communication coming over the Bluetooth Module. Upload this code and test it out. Does it work? Did your additional code work as well? What happens when you type “forward” instead of “Forward”? The command doesn’t work, does it? Sometimes it’s important to help your user (the person giving Sparki the commands may not always be you) by making your communication robust. This means that there are a couple different ways to communicate or make things happen written into the code and everything doesn’t always have to go exactly perfectly. Which is a good thing to do when you’re dealing with humans instead of robots. What we’ll do is add to the “if/else” statement conditionals (the bits inside the parenthesis) so a bunch of different commands work. Feel free to add whatever commands you want on top of the ones I show you. You might even want to put a secret word with another “if/else” statement into Sparki’s code so that something really amazing happens if a user types that word into the Terminal. Nice. Now our Sparki command code is a little more robust. What are some other ways you could make the code robust? You could add different languages. What about if a user types in a bunch of spaces before or after a command? Will this code still work? How about creating some code that gets rid of spaces? I already showed you how to find a carriage return and do something different if the character is a carriage return, that’s very similar to what you would need to do for a space…. There’s one last way to make our communication with Sparki very robust that we’ll cover in this lesson. What if a user wants to send Sparki a set of words that will make Sparki perform actions, all with one line of communication? We’ll cover the code you need to use to help Sparki understand multiple words in a single line of communication. Ok, pseudo-code time. Here’s a brief list of what we need to accomplish, there might be bits we miss but we’ll add that in as we go and problems arise. You should be used to this by now…. Wow. That’s a lot of code. It’s a good thing we’ve already done some of this work with our previous code. It’s also a very good thing we wrote the steps out and didn’t just jump into writing code. With complex programs it’s easy to get confused and make things more complicated than they really are if you don’t have a good plan before you get started. We’ll take this code one step at a time. 1. 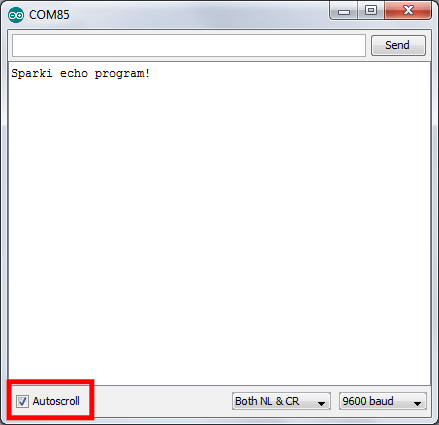 Send a communication from Sparki to the Terminal explaining how to communicate with Sparki and wait for the Terminal user to respond with “OK”- this will be pretty easy. It’s more or less like the code we worked on previously, except instead of making Sparki’s motors move when it gets the “OK” command, we’ll make Sparki send back a message and get ready to receive commands. In order to make this portion of the code happen over and over again while Sparki is waiting for an “OK” message we’ll use a “while” loop. A “while” loop is just like an “if” statement except it happens over and over again if the condition inside the parenthesis is true. This will make an array of Strings called commArray that has ten spaces for storing Strings. Strings use a lot of memory and we’re not sure how long the Strings we’ll be storing in our array will be, so we’ll limit the size of the array to ten. If you’re into communication and parsing information you’ll get into optimizing this code later, for now let’s move on to get something working. 3 & 4. Create a counter variable to keep track of where we are in the word array & Create a boolean variable to keep track of whether Sparki is ready to receive a communication from the Terminal– Man, this should be really easy by now. Just add an integer variable and a boolean variable below comArray. I’m going to leave the rest of this code up to you write. You should be able to store multiple words in Sparki’s commArray by now. It’s up to you to figure out how to do the final steps listed below. Good luck! How about creating a communication program that asks the user to send a character and a number, instead of just a single character? This way the user can control the movement command even more. For example a “F 10” serial communication might make Sparki move forward for ten seconds or ten centimenters and a “R 90” might make Sparki turn ninety degrees to the right. What if Sparki hasn’t finished with its current movement commands and the user sends a command over the Bluetooth Module serial connection? Can you figure out how to change the makeMove( ) function so that Sparki sends a “Please be patient while I finish this movement” communication? There is no end to the different things you can do with Bluetooth and Sparki! 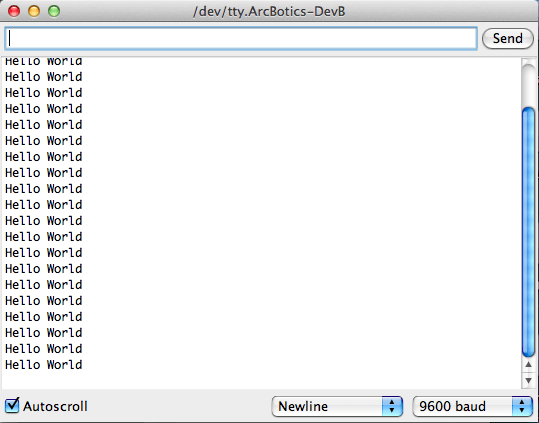 You could even add a special command to make Sparki enter Maze Solving or Line Following mode if you like. Here’s some code that makes Sparki do all of the actions outlined in the Sending Multiple Commands in One Line of Communication section. 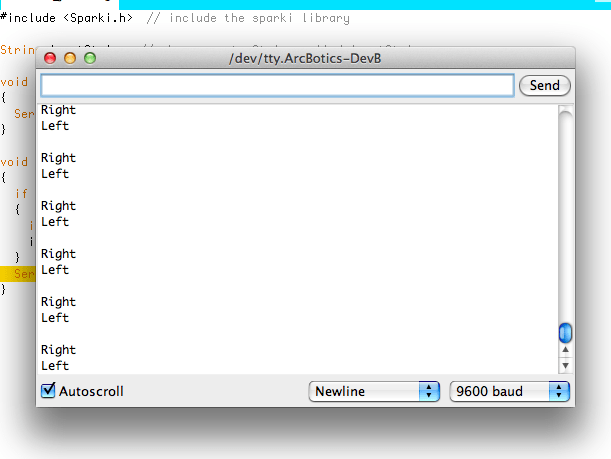 Sparki still needs a backwards command, though. Feel free to add that and anything else you like on your own! If you haven’t seen it yet, another useful way of showing values from variables, sensor readings, etc. is by using the LCD display. Here is a lesson on First Steps with the LCD Display where you can learn more about it.